As members of one global community, we acknowledge the expression of democracy underway in the United States and the peaceful transition of power that now begins, as a new administration settles into place in Washington, D.C. Record voter turnout has marked this electoral season in many locations, and it was also notable for the impassioned positions of those who conveyed differing viewpoints during that process. We thank and congratulate our community for setting an example to others throughout this election season. We welcomed debates, discussions, and other events hosted on our campuses worldwide. 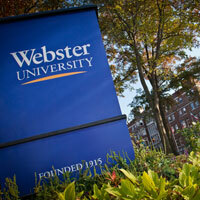 Despite the national mood in the U.S., these discussions on our campuses showed that Webster University is a supporter of free speech and civil dialogue. We join our community with the conviction that we will continue to provide that peaceful example for others to emulate. This year, we as a community engaged the question of what it means to be a good neighbor in a diverse and inclusive environment. As our core values affirm, neighborliness begins with respect, especially respect for others with opposing viewpoints. At times like these, we realize words can be one of the singular forces shaping our community. We have learned that community engagement is essential throughout the electoral process and we will constructively shape our communication to advance through the coming days. Thoughtful words among neighbors have the energy and power to heal. We know the outcome of the election will ripple through our global community. As the pundits already predict, this historic time will be debated and studied for many years to come. As a university community, of course, we are engaged in that examination already, not only on the impact to the United States but to the world. Through our community engagement we acknowledge that we must see the world as our home and not define ourselves as subsets of independent, isolated, and insular societies. Our emphasis on global citizenship demands that we engage intellectually about what the election has produced and do so with care and respect. Webster University has an unwavering commitment to be a notable example of civil discourse in these times and for the future ahead. Webster was, is, and will continue to be a safe place of acceptance where those from all communities can take part in the intellectual exchange that is the heart of the best university communities.